Your vehicle is equipped with a power connector to prevent battery discharge if your vehicle is parked without being operated for prolonged periods. Use the following procedures before parking the vehicle for prolonged periods. 3. Open the driver’s side panel cover and pull up the power connector. 4. Insert the power connector in the opposite direction. 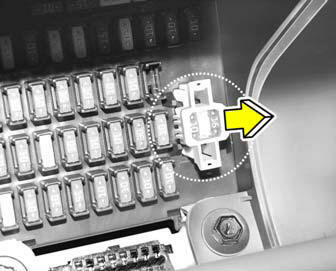 o If the power connector is pulled up from the fuse panel, the warning chime, audio, clock and interior lamps, etc., will not operate. The following items must be reset after replacement. o Even when the power connector is pulled up, the battery can still be discharged by operation of the headlights or other electrical devices.